NATIVE EXTRACTS works directly with the highest quality growers and processes to deliver ingredients from Australia's pristine environment and potent untapped reservoir of phyto-actives. We have sourced the most potent and pure Aloe Vera Extract from the micronised inner leaf pulp – extracting, stabilising and processing within hours of harvest ensuring optimum efficacy and excellent quality control. 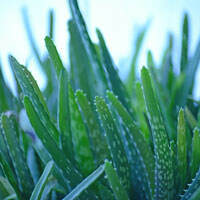 The Aloe Vera is grown without synthetic fertilizers or pesticides. No chemicals are used. Discover how you can use this Aloe Vera 1:1 Extract as a substitute to the powders, and release the outstanding range of natural Amino Acids, Vitamins and Minerals in your formulations. Work with Nature's Pure solution, taking natural product development to new heights. ALANINE: Good functioning of skin's adrenal glands. ASPARAGINE: Helps maintain balance in the central nervous system. ASPARTIC ACID: For heart and blood vessels. GLUTAMINE:  An ant-gastial duodenal ulcer drug found abundantly in Aloe Vera Juice; Readily passes the blood/brain barrier; Helps maintain proper pH-alkalinity, and healthy digestive track; Aids the body during periods of stress; Prevents muscle wasting. GLUCINE: For the immune system. HISTIDINE: For hearing and nerve cells. LEUCINE: Essential in helping the body build other amino acids; Lowers blood sugar levels; Aids in increasing growth hormone production. METHIONINE: Liver and kidney cleanser and regeneration. THREONINE: Assists metabolism and assimilation, intestinal and digestive tract function. ARGININE: For burning fat and muscle building. CLUTAMIC ACID: For brain health. CYSTEINE: Hair growth and life span extension. LYSINE: Fights herpes and simple viral infections. PHENYLALANINE: For tissue maintenance and normal growth. SERINE: Tissue cleansing in lungs and bronchial. TYROSINE: For alertness and better memory. VALINE: The spark of mental vigour. A: Antioxidant, protects the body against heart disease, cancer, eye damage. B1 THIAMINE: Skin, eyes, hair, heart function, nerve tissue, muscles, brain, circulation. B2 RIBOFLAVIN: Assists with carbohydrate, fat and protein metabolism, antibody and red blood formation, healthy eyes, hair, skin and nails. B3 NIACINAMIDE: Nervous system, dermatitis, diarrhoea, gastrointestinal disturbances, dementia, headaches, dizziness, insomnia, memory impairment. B6 PYRIDOXINE: Dermatitis, insomnia, weakness, irritability and kidney stones. C ASCORBIC ACID: Normal cell function, immune system, cold and flu. D: Growth in children, kidney and liver disease. E d-ALPHA TOCOPHERYL: Heart, lungs, eyes, liver, skin, infertility, circulation, scar tissue and muscles. IRON: Haemoglobin and myoglobin, growth, teeth, skin, nails, bones and fatigue. CALCIUM: Bone structure, teeth, blood clotting, nervous system, and insomnia. COPPER: Helps fuel energy production, prevent anaemia and bone disease. POTASSIUM: Body waste disposal, oxygen to brain, blood pressure, diabetes, heart muscles, nervous system and teeth. SODIUM: Essential for body cell and fluid functions. MANGANESE: Diabetes prevention, muscle strength, male potency, breast milk stimulant, utilises Vitamins B1 and E, aids metabolic processes. CHOLINE: Breaks down fat deposits, helps prevent atherosclerosis and heart disease. MAGNESIUM: Nervous system, memory, learning ability, sleep, menstrual cramps, aids Calcium and phosphorus metabolism, nervous system, heartbeat regulator, digestion, bones, arteries, heart and teeth. All information compiled by Supplier / Manufacturer.